WBA Cruiserweight World Champion Yunier Dorticos (22-0, 21 KOs) retained his title and stamped his place in the World Boxing Super Series Cruiserweight Semi-finals Saturday night with a sensational second round knockout of Dmitry Kudryashov (21-2, 21 KOs) in their quarter-final bout from the Alamodome in San Antonio. The unbeaten champion Dorticos landed a thunderous overhand right after Kudryashov threw a glancing jab during a second round exchange and sent the Russian to the canvas. Kudryashov attempted to get to his feet, but referee Rafael Ramos had seen enough and ended the bout at 2:10 into the second round. After a first round that saw both men feel each other out and land only a few significant blows, a heated exchange erupted in the opening moments of the second round with power punches being thrown from all angles. Dorticos appeared to hurt Kudryashov early in the round as he connected with a right hand that froze Kudryashov on the ropes. Dorticos piled on and delivered numerous right hooks with no response from his opponent until Kudryashov was eventually able to fight off of the ropes. Shortly after the action returned to the center of the ring, Dorticos was able to land the decisive blow and signal an end to the match. Dorticos will continue his quest for the Muhammad Ali Trophy in the semi-finals when he takes on the winner of the WBSS quarter-final bout between IBF Champion Murat Gassiev and former champion Krzysztof Wlodarczyk on October 21 in New Jersey. In the WBSS cruiserweight reserve match, once-beaten Keith Tapia (18-1, 11 KOs) dropped previously once-beaten Lateef Kayode (21-2, 16 KOs) and won a unanimous decision in their 10-round contest. Tapia sprinted out of his corner to start the fight and set the tone early, smothering Kayode in the corner with a flurry of punches. While Kayode was able to survive the round on his feet, it set the pace for the remainder of the match. 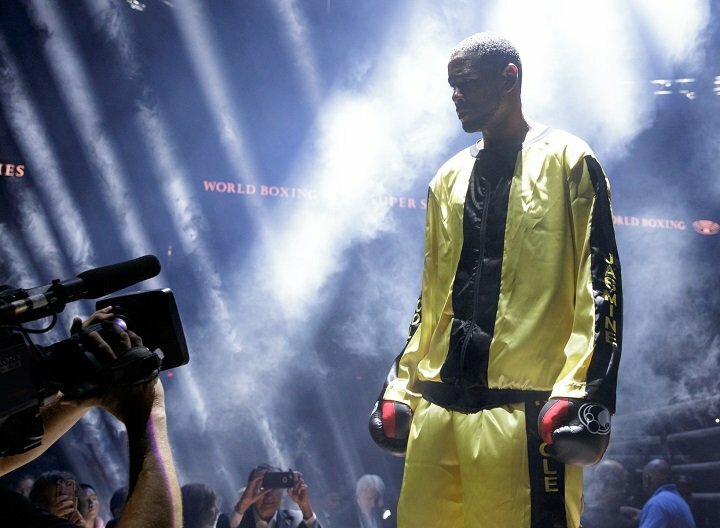 Representing Puerto Rico, Tapia found a home for his powerful right hand all night and connected flush on Kayode’s chin and dropped him as the bell sounded to end round six. Kayode was again able to continue to continue but found more trouble in the late rounds as he was stunned late in round eight and had a cut that started earlier in the fight open up at the end of round nine. After 10 rounds the judges awarded Tapia the unanimous decision by scores of 100-89 twice and 99-90. Additional action saw former four-division world champion Nonito Donaire (38-4, 24 KOs) return to the ring and score a dominant unanimous decision victory over Mexico’s Ruben Garcia Hernandez (22-3-1, 9 KOs) in their 10-round fight for the WBC Silver Featherweight World Title. Donaire was able to control the fight with his speed and movement that was unmatched by his opponent. Hernandez was game and continued to come forward all night, but was unable to disrupt Donaire. Hernandez’s aggressiveness was used against him by Donaire, who waited for his charging opponent and was able to pick him off with an array of hooks and uppercuts. After 10-rounds all three judges saw the fight in favor of Donaire by scores of 100-90, 99-91 and 97-93.